Seriously, it even looks like a superhero's logo. Maybe a lantern. 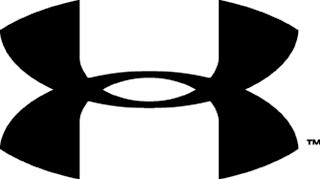 I sucked it up and got some Under Armour shirts for working out. Now I can go to a gym and at least not look like a dweeb in front of all the meatheads. No one likes to look like a dweeb in front of the meatheads. Looking at myself in the mirror of the dressing room, I had to admit: I hated myself just a little bit, in the same way and for the same reasons I hated seeing football players suited up for game day back in high school. Also, like I kind of hate hearing about Lance Armstrong, but only when I wore the shirt in blue and pretended I only had one testicle and cheat on my wife. The kind of funny thing is that for the first time in my life I'm fitting into a Size-L shirt. I mean, yeah, it's a compression-fit large, and a regularly fitted Small is enormous on me, but dammit I finally feel like a big man, I'm not taking that away from myself. In fact, it's a blessing. I'm going to pick up a long-sleeved version in medium because when I tried it on before it didn't just make me feel like a big man, with that black "second skin" stretched and contouring my form in pleasingly deceptive ways, I felt like Batman. So yeah, I'm getting one size down and long sleeves so I can be a superhero. It's going to be awesome.